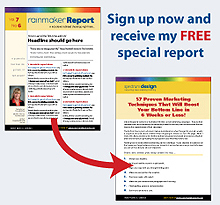 Sometimes, to find the right solution you just need to "step outside of the box"
57 marketing secrets proven to boost your bottom line in 6 weeks or less! Something crucial (and unusual) you must do to every headline in your advertisements before they go to print! The single best offer you can make in your advertisement regardless of what you are selling! 5 deadly mistakes most advertisers make when creating their ads and how to avoid them! How to overcome the single most difficult aspect of managing clients. 3 strategies for segmenting clients that will ramp-up your return-on-investment. The single best way ever discovered to sell anything…and…sell it fast. What question you must ask when you are trying to convince a prospect to buy what you are trying to sell. A dirty little secret your competitors hope you never find out!